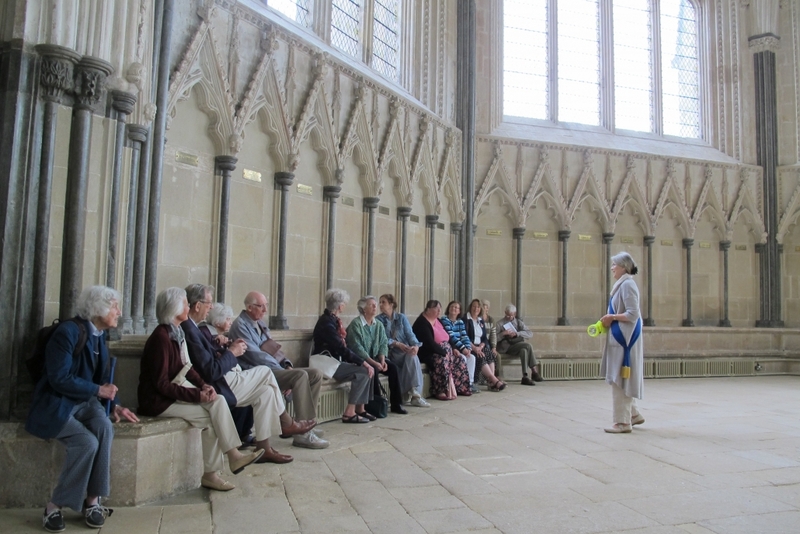 Eighteen members of The Shaftesbury & District Historical Society enjoyed their summer outing on 05 June to the Somerset City of Wells. An expert guided tour by Cathedral volunteer Anne Smith highlighted the sculpture-laden West Front, the secular stories (frequently featuring toothache) carved in the capitals of internal pillars, and the unusual Scissor Arches inserted to strengthen the Crossing under the weight of a central Tower. The tour was timed to include the noon striking of the fourteenth century clock, with its rotating jousting knights and quarter-jack Jack Blandiver. Welcomed to the nearby Wells and Mendip Museum by Trustee Andrew Fawcett, members were able to examine plaster casts of the four capitals telling the story of a grape thief and his salutary punishment, and walk through an impressive reconstruction of a Great War trench. The afternoon concluded with a privilege visit to the City of Wells Almshouses, courtesy of the residents, with a tour of terraces dating from the fifteenth to the nineteenth centuries, and tea and home-made cake in the Guild Room. This was the meeting place of Wells Council until the eighteenth century saw the building of the Town Hall, which plays the part of Warleggan Bank in the latest series of Poldark.